For a detailed background on ResourceTiming, you can see my post on ResourceTiming in Practice. One important caveat when working with ResourceTiming data is that in most cases, it will not give you the full picture of all of the resources fetched during a page load. The combination of these restrictions — some in our control, some out of our control — leads to an unfortunate caveat when analyzing ResourceTiming data: In the wild, you will rarely be able to access the full picture of everything that was fetched on the page. How many resources are being fetched by my advertisements? What is my Page Weight? We’ll explore what ResourceTiming Visibility means for your page, and how you can work around these limitations. We will also sample ResourceTiming Visibility data across the web by looking at the Alexa Top 1000, to see how frequently resources get hidden from our view. There is a bit of complexity added when you have frames on the site, e.g. from third-party content such as social widgets or advertising. Since each <iframe> has its own buffer of ResourceTiming entries, you will need to crawl all of the frames on the page (and sub-frames, etc), and join their entries to the main window’s. This gist shows a naive way of doing this. For a version that deals with all of the complexities of the crawl, such as adjusting resources in each frame to the correct startTime, you should check out Boomerang’s restiming.js plugin. The main challenge with ResourceTiming data is that cross-origin resources and cross-origin frames will affect the data you have access to. Unfortunately, for most websites, you will not be in control of all of third-party (and cross-origin) assets being served to your visitors. Some third party domains have been adding the Timing-Allow-Origin header to their responses, but not all — current usage is around 13%. In addition, every <iframe> you have on your page will have its own list of ResourceTiming entries. You will be able to crawl any same-origin and anonymous frames to gather their ResourceTiming entries, but cross-origin frames block access to the the contentWindow (and thus the frame.performance) object — so any resources fetched in cross-origin frames will be invisible. Note that adding Timing-Allow-Origin to a cross-origin <iframe> (HTML) response will give you full access to the ResourceTiming data for that HTML response, but will not allow you to access frame.performance, so all of the <iframe>‘s ResourceTimings remain unreachable. Unfortunately, if you were to use the ResourceTiming API at the same time, you may only be getting a subset of that data. ResourceTiming isn’t giving you the full picture. Without the same visibility into the resources being fetched on a page as a developer has using browser developer tools, if we are just looking at ResourceTiming data, we may be misleading ourselves about what is really happening in the wild. ResourceTiming has given us fantastic insight into the resources that our visitors are fetching when visiting our websites. One of the key benefits of ResourceTiming is that it can help you understand what third-party libraries are doing on your page when you’re not looking. All of these third-party resources can be loaded in a multitude of ways as well. Some of may be embedded (bundled) directly into your site; some may be loaded from a CDN (such as cdnjs.com); some libraries may be loaded directly from a service (such a Google Fonts or Akamai mPulse). The true cost of each library is hard to judge, but ResourceTiming can give us some insight into the content being loaded. It’s also important to remember that just because a third-party library behaves one way on your development machine (when you have Developer Tools open) doesn’t mean that it’s not going to behave differently for other users, on different networks, with different cookies set, when it detects your Developer Tools aren’t open. It’s always good to keep an eye on the cost of your third-party libraries in the wild, making sure they are behaving as you expect. So how can we use ResourceTiming data to understand third-party library behavior? We can understand the weight (byte cost) of the third party, and the dependencies it brings in, by looking at the transferSize. We can also see if it’s properly compressed by comparing encodedBodySize to decodedBodySize. In order to get the detailed timing information and weight of third-party libraries, they need to be either served same-domain (bundled with your other assets), or with a Timing-Allow-Origin HTTP response header. Otherwise, all you get is the overall duration (without DNS, TCP, request and response times), and no size information. Contrast all of this information to a cross-origin request to http://www.google-analytics.com/collect. This resources does not have Timing-Allow-Origin set, so we only see its total Duration (deep blue). For some reason this beacon took 648 milliseconds, and it is impossible for us to know why. Was it delayed (Blocked) by other requests to the same domain? Did google-analytics.com take a long time to first byte? Was it a huge download? Did it redirect from http:// to https://? Since the URL is cross-origin without Timing-Allow-Origin, we also do not have any byte information about it, so we don’t know how big the response was, or if it was compressed. Also remember that any third-party library that loads a cross-origin frame will be effectively hiding all of its cost from ResourceTiming. See the next section for more details. Ads are a special type of third-party that requires some additional attention. How much content is loaded within your page’s top level window and has Timing-Allow-Origin set? How much content is loaded within same-origin (anonymous) frames and has Timing-Allow-Origin set? 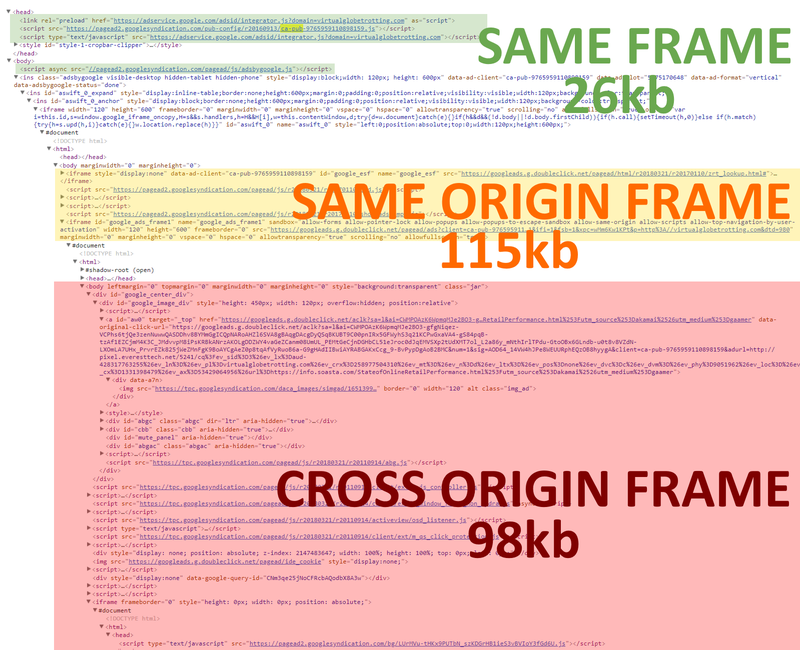 How much content is loaded from a cross-origin frame? In the screenshot below, the green content was loaded into the top-level window. Thankfully, most of Google AdSense’s resources have Timing-Allow-Origin set, so we have complete visibility into how long they took and how many bytes were transferred. These 3 resources accounted for about 26 KB of data. If we crawl into accessible same-origin frames, we’re able to find another 4 resources that accounted for 115 KB of data. Only one of these was missing Timing-Allow-Origin. Most advertising platforms’s ads are loaded into cross-origin frames so they are less likely to affect the page itself. Unfortunately, as you’ve seen, this means it’s also easy for advertisers to unintentionally hide their true cost to ResourceTiming. Another challenge is that it makes it really hard to measure Page Weight. 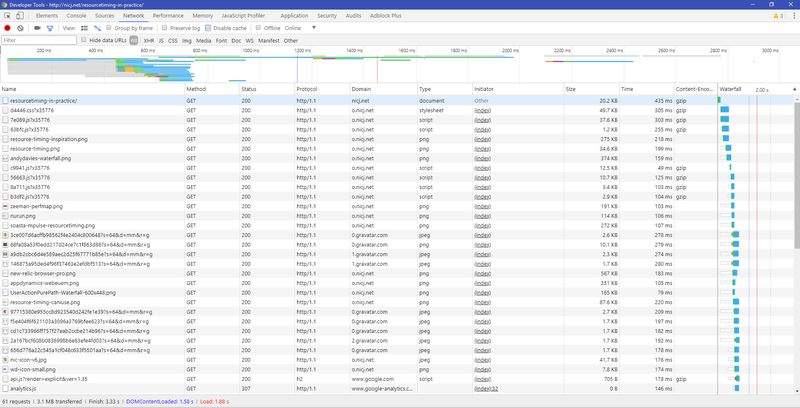 Page Weight measures the total cost, in bytes, of loading a page and all of its resources. Remember that the byte fields of ResourceTiming (transferSize, decodedBodySize and encodedBodySize) are hidden if the resource is cross-origin. In addition, any resources fetched from a cross-origin frame will be completely invisible to ResourceTiming. Anything less than the above, and you’re not seeing the full Page Weight. How many of your resources are fully visible to ResourceTiming? How many are visible, but don’t contain the detailed timing and size information due to cross-origin restrictions? How many are completely hidden from your view? 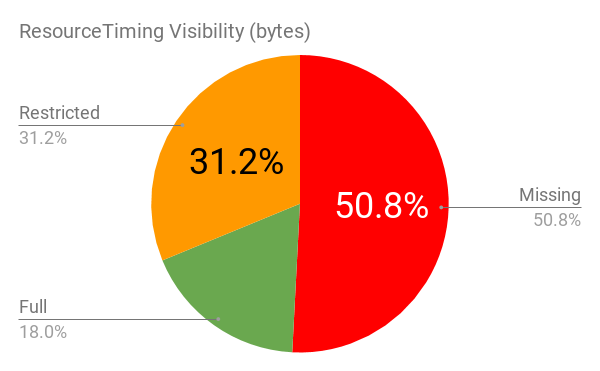 There’s been previous research and HTTP Archive stats on Timing-Allow-Origin usage, and I wanted to expand on that research by also seeing how significantly the cross-origin <iframe> issue affects visibility. To test this, I’ve built a small testing tool that runs Chrome headless (via puppetteer). The tool loads the Alexa Top 1000 websites, monitoring all resources fetched in the page by the Chrome native networking APIs. It then executes a crawl of the ResourceTiming data, going into all of the frames it has access to, and compares what the browser fetched versus what is visible to ResourceTiming. Full: Same-origin resources, or cross-origin resources that have Timing-Allow-Origin set. These have all of the timing and size fields available. Restricted: Cross-origin resources without Timing-Allow-Origin set. These only have startTime and responseEnd, and no size fields (so can’t be used for Page Weight calculations). Missing: Any resource loaded in a cross-origin <iframe>. Completely invisible to ResourceTiming. 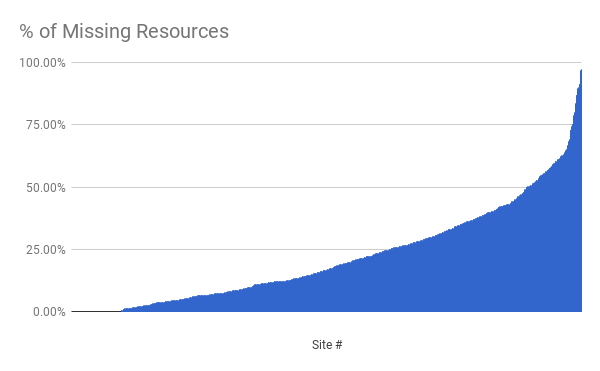 Across the Alexa Top 1000 sites, only 22.3% of resources have Full visibility from ResourceTiming. It’s interesting how Visibility commonly differs by the type of content. For example, CSS and Fonts have a good chance of being Full or at least Restricted Visibility, while Tracking Pixels and Videos are often being loaded in cross-origin frames so are completely Missing. Let’s look at a couple of these types. For the purposes of this analysis, HTML resources have an initiatorType of iframe or were a URL ending in .htm*. Note that the page itself is not being reported in this data. Remember that all top-level frames will show up in ResourceTiming, either as Full (same-origin) or Restricted (cross-origin without TAO). 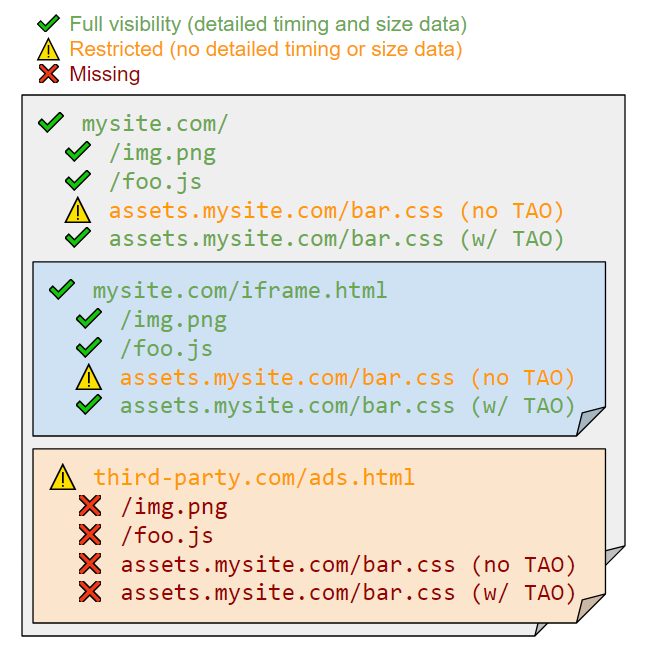 Thus, HTML content that is being reported as Missing must be an <iframe> loaded within a cross-origin <iframe>. All of these appear to be <iframes> injected for cross-frame communication. Missing video content appears to be pretty site-specific — there aren’t many shared video URLs across sites (which isn’t too surprising). What is surprising is how often straight <video> tags don’t often show up in ResourceTiming data. From my experimentation, this appears to be because of when ResourceTiming data surfaces for <video> content. In the testing tool, I capture ResourceTiming data at the onload event — the point which the page appears ready. In Chrome, Video content can start playing before onload, and it won’t delay the onload event while it loads the full video. So the user might be seeing the first frames of the video, but not the entire content of the video by the onload event. However, it looks like the ResourceTiming entry isn’t added until after the full video — which may be several megabytes — has been loaded from the network. 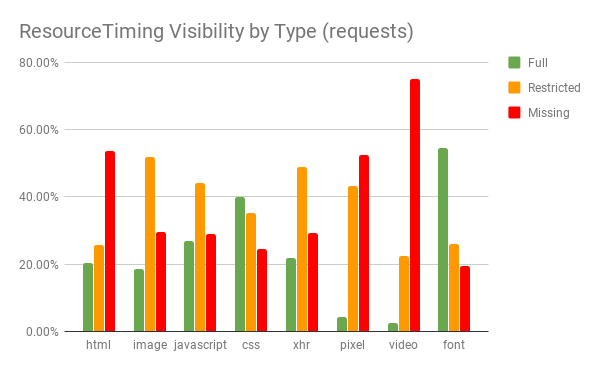 So unfortunately Video content is especially vulnerable to being Missing, simply because it hasn’t loaded all frames by the onload event (if that’s when you’re capturing all of the ResourceTiming data). Also note that some browsers will (currently) never add ResourceTiming entries for <video> tags. Across the Alexa Top 1000, there are some URLs that are frequently being loaded in cross-origin frames. Let’s hope Timing-Allow-Origin usage continues to increase! By default, each frame will only collect up to 150 resources in the PerformanceTimeline. Once full, no new entries will be added. How often do sites change the default ResourceTiming buffer size for the main frame? 85.4% of sites don’t touch the default ResourceTiming buffer size. Many sites double it (to 300), and 1% pick numbers over 1000. Should you increase the default buffer size? Obviously the need to do so varies by site. 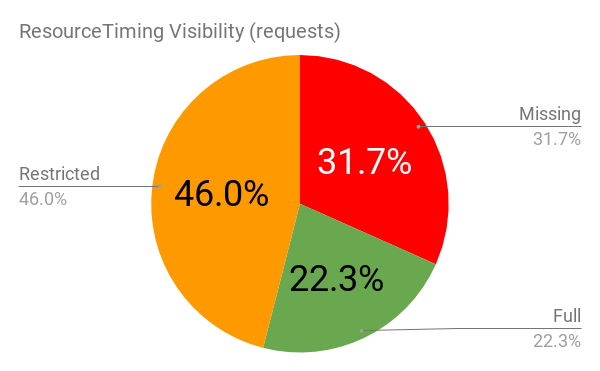 In our crawl of the Alexa Top 1000, we find that 14.5% of sites exceed 150 resources in the main frame, while only 15% of those sites had called setResourceTimingBufferSize() to ensure all resources were captured. Given the restrictions we have on cross-origin resources and frames, what can we do to increase the visibility of requests on our pages? To move Restricted Visibility resources to Full Visibility, you need to ensure all cross-origin resources have the Timing-Allow-Origin header. This should be straightforward for any content you provide (e.g. on a CDN), but it may take convincing third-parties to also add this HTTP response header. Most people specify * as the allowed origin list, so any domain can read the timing data. All third party scripts should be doing this! Obviously this limitation will affect any site that loads more than 150 resources in the main frame (or over 150 resources in a <iframe>). Alternatively, you can use a PerformanceObserver (in each frame) to ensure you’re not affected by the limit. It’s possible to “leak” ResourceTiming to parent frames by using window.postMessage() to talk between cross-origin frames. Here’s some sample code that listens for new ResourceTiming entries coming in via a PerformanceObserver, then “bubbles” up the message to its parent frame. The top-level frame can then use these bubbled ResourceTiming entries and merge them with its own list from itself and same-origin frames. The challenge is obviously convincing all of your third-party / cross-origin frames to use the same bubbling code. We are considering adding support for this to Boomerang. In the absence of having perfect Visibility via the above two methods, it makes sense to supplement your Real User Monitoring analytics with synthetic monitoring as well, which will have access to 100% of the resources. You could also use synthetic tools to understand the average percentage of Missing resources, and use this to mentally adjust any RUM ResourceTiming data. ResourceTiming is a fantastic API that has given us insight into previously invisible data. With ResourceTiming, we can get a good sense of how long critical resources are taking on real page loads and beyond. My hope is that we get more third-party services to add Timing-Allow-Origin to all of the resources being commonly fetched. It’s not clear if there’s anything we can do to get more visibility into cross-origin frames, other than convincing them to always “bubble up” their resources. For more information on how this data was gathered, you can look at the resourcetiming-visibility Github repo. I’ve also put the raw data into a BigQuery dataset: wolverine-digital:resourcetiming_visibility. Thanks to Charlie Vazac and the Boomerang team for feedback on this article. This is currently not working in Chrome but may happen soon.